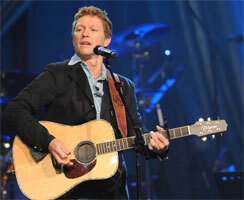 Chanteur Country US né Craig Morgan Greer, le 17 Juillet 1964 à Kingston Springs (Tennessee). Singer/songwriter Craig Morgan was an army brat before he opted for a career in music. Born and raised in Nashville, Morgan was already a country music fan with dreams of playing guitar and making it big. But before his musical dreams could become reality, Morgan spent time serving in the U.S. Army, where he had a very respectable career and achieved high honors during peace and wartime. It was also during this time that Morgan whetted his guitar-playing styles to perform for troops whenever he could. Such passion led to a deal with Atlantic and a spot out of the service. His self-titled debut was released in May 2000. His next three albums, 2002's I Love It, 2005's My Kind of Livin', and 2006's Little Bit of Life, all appeared on Broken Bow Records. 05/2000 SP ATLANTIC 7-84669 (US) . 11/2001 CD BROKEN BOW 0011 (US) . 2011 CD Black River ? (US) .